If you’ve been following along lately you might know that I’ve decided to give the 2B Mindset a try between rounds of 21 Day Fix. So far it has been surprisingly great! If you are needing some great protein options for the 2B Mindset this is the post for you. All of these 2B Mindset chicken recipes are healthy but they’re also family approved! No more multi-meal cooking for yourself and the rest of the family. For those of you who aren’t following the 2B Mindset nutrition plan or the 21 Day Fix, all you need to know is that these recipes are not only delicious…they’re also healthy! A win, right? What is the 2B Mindset Nutrition Plan? 2B Mindset is a new program from Beachbody. It’s a nutrition plan that helps to teach you portion sizes and healthy eating habits. The way the program works is by dividing food into three categories (more or less): Vegetables, Fiber Filled Carbs, and Protein. These three groups are then used to fill your “plate” at each meal. Each meal has a different plate division. Sometimes you are eating 50% veggies and 50% protein and other times there are FFC’s mixed in! 2B Mindset has a list of approved foods for each group and there are videos to guide you through making your daily choices. Another big component of the program is drinking water. Before each meal you are supposed to try and drink at least 16 oz. of water. This not only helps keep you hydrated but it also works to keep you feeling full throughout the day and it helps prevent overeating. More times than not we’re actually thirsty when we feel hungry! Of course there are a lot more little details about the program that you learn along the way, you can read about the full program right here. Like any healthy lifestyle, 2B Mindset is a journey. You are going to need help at some point or another along the way. I’ve started compiling some awesome resources to help you out! Check out some of these other posts for more information on the program itself and recipe roundups to fill out your meal plans. How Do I Do 2B Mindset? The program is largely based online. There are no meetings or check ins and you don’t technically have to go workout or log on to follow along with workouts. Chicken is a multipurpose protein, so a lot of these 2B Mindset chicken recipes will be useful for your meals throughout the day and throughout the week. If you are like me and prefer to meal plan at least a little bit for the week, these are versatile recipes that you’ll want to have on hand! 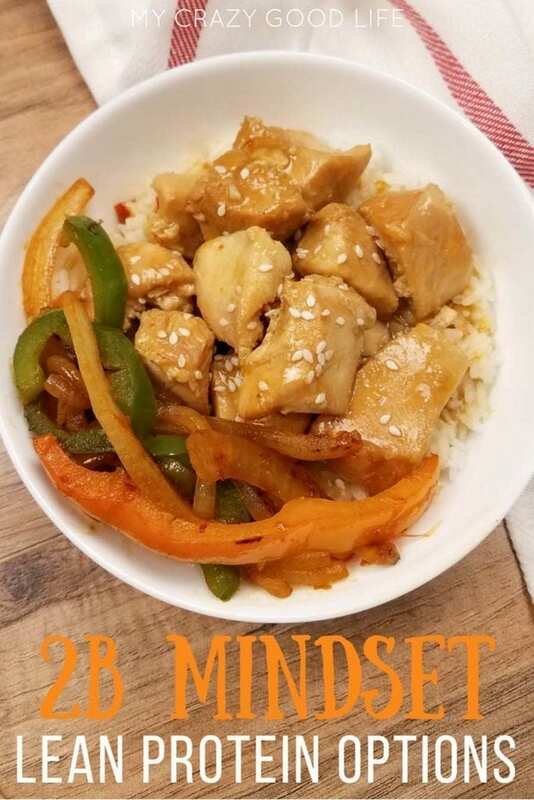 Where Can I Find Amazing 2B Mindset Chicken Recipes? Right here, of course! 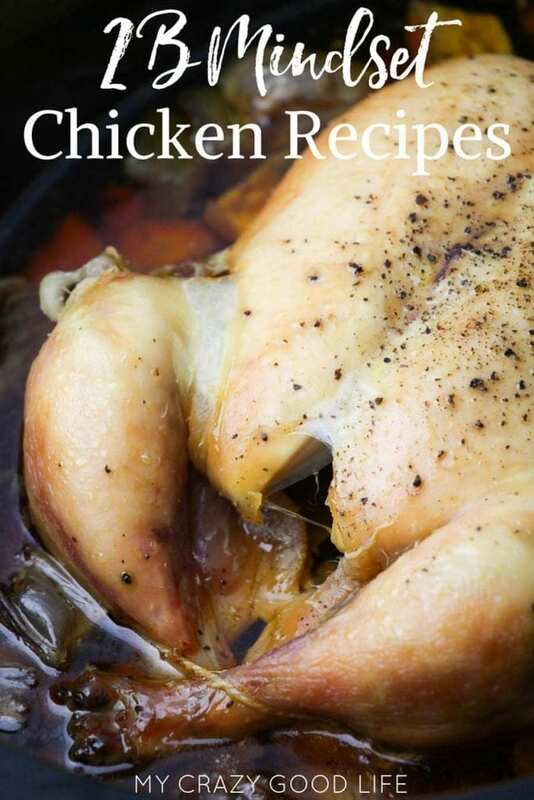 Just kidding, there are lots of chicken recipes out there that you can use for 2B Mindset. Chicken falls into the protein category so it’s going to be pretty integral to your journey on the 2B nutrition plan. I know some people don’t really love chicken but it’s a great lean protein that we eat pretty regularly both as a family and on our healthy lifestyle plans. Remember, the portions are different for your different meals throughout the day. You may have to adjust the portions or add in some fiber-filled carbs or veggies depending on the meal. Don’t be afraid to step outside your comfort zone and try some new and tasty recipes, with a little bit of adjustment you can make any of these work for your different meals throughout the day. These recipes are all 21 Day Fix friendly as well so if you aren’t on 2B Mindset you can still use these tasty recipes in your meal plan this week! Crockpot Chicken For Meal Prep This is a great staple to start your meals with. Rotisserie Chicken Soup With Salsa This soup is a family favorite! Leave the tortilla strips out for dinner, and make add in another small FFC for lunch. Healthy Buffalo Chicken Dip Man, I love this recipe. It’s full of protein and a great happy hour dip! Cauliflower Spanish Rice with Chicken I love using my Instant Pot for this meal–I don’t love it for meal prep for more than a few days because of the cauliflower, but I’ll use it for a day or two. Instant Pot Orange Chicken Another favorite! This is perfect for lunch! Chicken Burrito Bowls Soooo easy, a great lunch and easy to add all of your veggies as toppings. Pasta with Broccoli and Chicken Sausage Leave the pasta out for dinner, or use this as your lunch for the week. Skinny Saag Chicken Another super yummy one. I love this when company comes over! Easy Caprese Chicken This recipe has rave reviews! It’s a favorite in our Facebook groups. Crack Chicken This is another dip that easily doubles as a meal. The great thing about 2B Mindset chicken recipes is that you can use them in so many different ways. You can pair them with your favorite veggies for dinner or add some carbs for breakfast…even eating leftovers for breakfast is possible on 2B Mindset! Cilantro Lime Chicken Tacos Taco Tuesday, anyone? Easy Lemon Chicken It tastes like a fancy dinner, but is so easy to make! Krispie Baked Chicken The kids will love this for lunch! Buffalo Chicken Craving wings? This is definitely a healthier choice. Quinoa Chicken Salad Perfect lunch! Arugula Salad with Chicken and Black Beans Another great lunch option, because of the black beans. Easy Chicken Bone Broth I love making this and freezing it to use in my Instant Pot recipes. Lemon Garlic Chicken Sheet Pan Dinner Sheet pan dinners are so easy to customize! 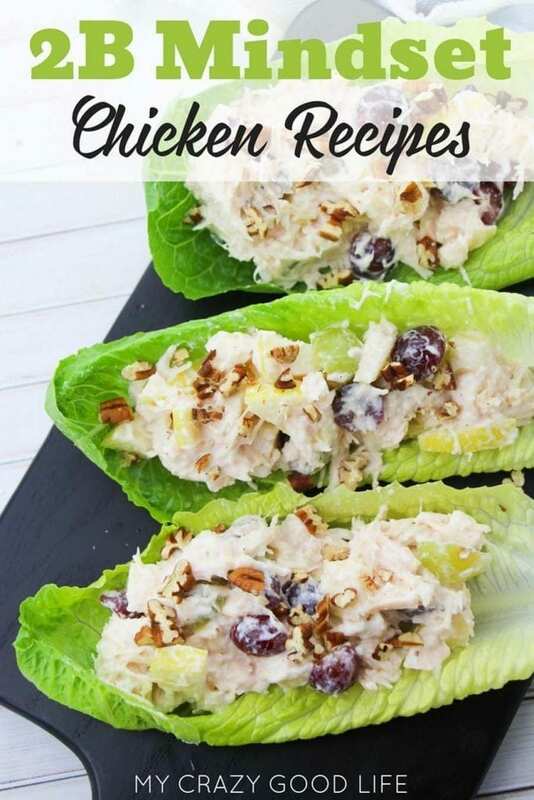 Chicken Salad Another great lunch or dinner option for 2B. If you are making any of the great whole chicken recipes make sure you save the broth and make your own bone broth! It’s so easy in the Crockpot or the Instant Pot. Makes a delicious stock for other recipes or soups and the health benefits are awesome too! Jerk Chicken with Mango Salsa Stephanie has amazing recipes–this is one we love! Instant Pot Asian Chicken We love this recipe, and it’s great for meal prep.